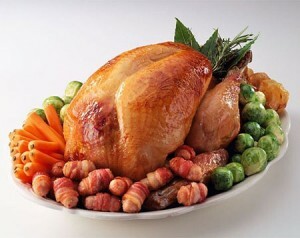 Our christmas meat comes from Glebelands Farm, Upton Pyne (www.tastybird.co.uk) who is our farming neighbour. He has been producing quality meat for over 50 years so can be trusted with your special lunch. Depending on your size of party, you should allow a portion of around a pound of meat per person, which roughly works out as 2 portions to a kilogram. The smallest bird we can supply is 5kg. Simply let us know which bird and what size, together with a £10 deposit and then collect from our shop a couple of days before Christmas (around 23rd normally). We usually have the order forms and prices available in the shop from October onwards. All birds will be supplied individually boxed with cooking instructions at an additional cost of £1.25 per order. Available from Creedy Carver, Crediton. We will give you a quote for the desired size – come and have a chat about your requirements and we’ll take it from there. Venison, wild boar, rabbit and alpaca are available to order. Come in and let us know the size of joint or number of portions needed and we’ll let you know the approximate cost. Our Auntie Pat makes the most amazing Christmas cakes and puddings in the traditional way, with a hand painted festive design on the cakes and alcohol in the puddings. Come into the shop to choose your favourite size and design.